After the announcement of her canceled speech at UC Berkeley, Ann Coulter attempted to let everyone know, now more than ever, that she knows exactly what it’s like to feel unsafe in a white suburban neighborhood. “I felt so attacked at having my event shut down. With a 29% of the campus being white, I figured I’d be protected on all sides. But not even THEN was I safe enough. I totally understand what you people are going through” she mentioned on the subway to a man browsing CNN on his phone whom she described as “probably an Obama supporter”. Routinely a critic of women’s right to vote, and the “browning of America,” Coulter felt like she was a changed woman after definitely having experienced what some of the “urbanites” do. “Frankly, I feel like if they had just let me on campus to express my dislike of 71% of the campus population, everything would have gone smoothly. But you just can’t trust them whities to keep their word, am I right, brother?” Coulter said in the direction of a man whose grandfather fought in WWII for the US. Witnesses report that Coulter began walking through the streets of Upper Manhattan with a look of complete fear and disillusionment. 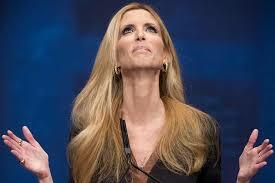 When pressed, Coulter stated: “It’s upsetting that we can’t trust our own kind anymore, and by that I mean Americans. If we can’t say what we think of lesser races anymore, I don’t even want to live in this country. I guess this is the life of a minority, albeit a political one.” Afterwards, she clutched her bag closer to herself when a “rap enthusiast” walked by, on his way to a 9-5 job at the Bank of America.